Screwball Comedy is defined as a “principally American” genre of comedy. Born out of the Great Depression, these comedies originated in the early thirties and continued into the forties. Many of the films created some of the best “Battles of the Sexes” duos ever seen on film. Cary Grant shoving Katherine Hepburn backwards in “The Philadelphia Story” is just one example that comes to mind. Some of the best of the genre were films like It Happened One Night, The Awful Truth, The Thin Man, My Man Godfrey, Nothing Sacred, Bringing up Baby, His Girl Friday and To Be or Not to Be. Cary Grant, Carole Lombard, and Katherine Hepburn all made their mark in this genre. The women were characterized as being flighty and vapid, but the times they were living in called for characters looking for instant gratification and immediate results. Thus the formula included cases of mistaken identity, lots of complications and constant motion with frenetic hand gestures and plenty of light comic relief. Anything to take the audiences mind off the depressing conditions outside the movie theatre. Top Hat was made in 1935, and definitely qualified as a screwball comedy. Yet it was not only a screwball comedy, it was a musical as well. 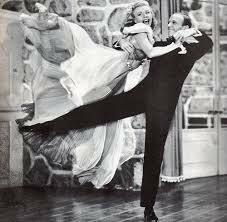 And it was one of the best films that Ginger Rogers and Fred Astaire made together. It included all of the necessary conditions that comprised a screwball comedy, and to top it off, the beautiful set decorations and costuming synced perfectly with the effortless dancing of Fred and Ginger. The icing on the cake for this film would be the Irving Berlin tunes that included the famous “Cheek to Cheek” number. Top Hat was nominated for four Academy Awards, including Best Picture of 1935. Top Hat is showing this Sunday at Tampa Theatre at 3:00 pm as part of the Summer Film series. After the film, University of South Florida film professor Harriet Deer will be leading a discussion about the movie. The session is free and open to the public. Previous Previous post: Michael Eisner is….right?